U.S. small businesses are doing it…are you? In my blog entitled “Fortune 100 companies are getting it…are you?”, I presented data from Burson-Marsteller that showed that 79% of Fortunate 100 businesses are using social media. While this information is very useful, it only represents the top 100 companies. So, our next question has to be, what is the biggest segment of the businesses population in the U.S. (i.e., small businesses) doing in terms of social media? Well, thanks to research Small Business Success Index put out by Grown Smart Business we have a glimpse! According to the results of the third wave of the Small Business Success Index™ (SBSI), sponsored by Network Solutions® and the Center for Excellence in Service at the University of Maryland’s Robert H. Smith School of Business, social media adoption by small businesses has doubled from 12% to 24% in the last year (based on interviews among 500 small business decision-makers). 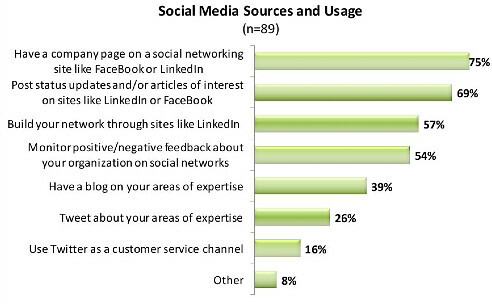 As the chart below shows, if they have a social media presence for their business, small business decision-makers are likely to have a company page on a social networking site (75%), to post status updates and/ or articles of interest on sites like LinkedIn or Facebook (69%), to have built a network through sites like LinkedIn (57%) and to monitor positive/negative feedback about their organization on social networks (54%). I would highly recommend that you check out the full report of The State of Small businesses and more specifically Small Business Success Index on Grow Smart Business’ website: http://growsmartbusiness.com/small-business-success-index-highlights/. It’s great to see that small businesses are seeing and getting the value of social media! Fortune 100 companies are getting it…are you? I was perusing the Mashable Social Media Guide website and I saw a great article on Social Media Trends at Fortune 100 Companies by Burson-Marsteller. It is amazing to me that 79% of Fortune 100 companies already use Twitter, Facebook, YouTube or corporate blogs to communicate with customers and other stakeholders. Fifty-four percent have at least one Facebook fan page, 50% have at least one YouTube channel, and 33% have at least one corporate blog. The most important finding, in my humble opinion, was the “proof” that consumers actually do like to engage with companies via social media. I would welcome any other statistics folks may have on social media usage! As I type this blog from the “happiest place on earth,” otherwise known as the soggiest place on earth as it has been raining since we got here, I am thinking about the true meaning of the word “lead”. To be successful in this world of interruption marketing–a world in which most of us operate—we, as marketers, need to better define what we consider a true lead and what is not. Specifically, our lead generation strategies need to include methods that help us customize first contacts and the overall “experience” with our company— in a way that matters to that potential client. As lead management and nurturing companies such as Eloqua and Silverpop will tell you, many of the companies we have deemed to be leads are really nothing more than weak prospects. These companies aren’t ready for, nor are they likely to appreciate, personal contact from us at the point we interrupt them; though, we will force that interruption on them. Why is the distinction between a lead and prospect so important? That’s because if we “interrupt” a prospective client too soon, in an annoying and non-personalized way, we could lose them forever. It’s like when you are browsing at a retail store and the sales person just won’t leave you alone. Interruption marketing works the same way. So how can we combat the pain we inflict on and potential loss of our prospective clients if we interrupt them too soon? I would recommend two simple, yet not necessarily easy, things: profiling/lead scoring and nurturing. Profiling & Lead Scoring—Believe it or not, many companies don’t differentiate between hot leads, warm leads and mere prospects, they treat them all the same. So the first step really is to determine how you should classify your leads and prospects— automatically if possible. To do this, you need to start with a determination of how potential clients will come to you. Once you determine this, you then need to determine value of the type of lead/prospect you have. When thinking of the value, don’t fall into the revenue trap; meaning don’t just focus on potential revenue of the prospective client. You should be thinking more broadly. Value could also include things like your need to build your client base in a certain region of the country, your need to attract clients in a certain industry and/or your need to gain customers that have political or social clout. Once you determine your value scores, you can determine an overall score for your lead/prospect. Nurturing—Once you have the score, the next step is a determination of whether contact can be made now or nurturing needs to occur first. So, by scoring your lead, you are systematically determining a couple of things: 1) should the prospect/lead receive immediate contact or not, 2) if not, when should contact occur (frequency) and how should it occur? (e-mail/mail/phone) and 3) what types of messages should be provided at each contact point. Your nurturing process can be as simple or sophisticated as your business dictates. To be successful in this world of interruption marketing, it is critical that we really understand and differentiate the leads and prospects we receive each day. By profiling, lead scoring and nurturing your leads and prospects, you will improve your chances of converting your leads/prospects into clients. Good luck in your lead generation and conversion programs!